A nice hotel on Archbishop Reyes directly in front of Ayala Center Cebu, Regal Business Park Hotel's recommended by Tutubi's business contacts who also took care of reservations and got 20% discount on corporate rate. It's a small, budget hotel in Cebu, unlike most of Tutubi's trips there where he stayed at the upscale Waterfront Hotel Lahug or at pension house during one of his first backpacking trips there, but it's well-within-budget for Tutubi and it's close proximity to Ayala center, SM City Cebu, and Fuente Osmena (the last two accessible via a 15 minute, a PhP50 taxi ride). 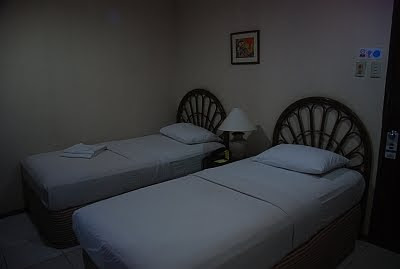 Regal Hotel's standard rooms (priced at P1800/night good for two persons) have two beds, hot and cold shower, buffet breakfast inclusive of the room rate and 24 hour free Internet wifi connection at the restaurant on the ground floor of the 6-storey hotel building. 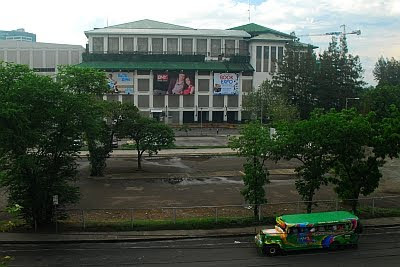 Ayala Center Cebu right across Regal Hotel, too early thus no cars in the parking lot. The best thing about Regal Business Park Hotel, of particular importance to Filipinos, is the presence of the tabo (ladle) in the bathroom. Tutubi will now announce the first recipient of the soon-to-be-prestigious (hopefully) Tutubi Tabo Awards to Regal Business Park Hotel for having a tabo, if not a bidet, to cater to Filipinos in need of one. Using a tabo is a cultural thing and most hotels and resorts don't have one. Tutubi need not cut out a mineral water PET bottle to make an improvised ladle on this trip. For inquiries, latest room rates, seminars, events (weddings, conferences, functions) and reservations, you may contact Regal Business Park Hotel's published telephone numbers or send email inquiries to addresses listed above. I am planning to reserve on this place this coming Sinulog festival 2011, I do hope I will have a fine and fun staying in this hotel.